Heck, they’re even good just for no other reason than being fun to play around with. And the prices have got really good, even for high quality units from pro-gear manufacturers like Yamaha. Typical online prices are around $140 up to $200 – which is crazy good value for what you can get. So here’s my quick round-up of what I think are the 3 best digital tabletop drum kits for 2019. You may not have heard of Pyle Audio, but if not, don’t worry. Pyle are a serious audio and electronics company. They make everything from pro DJ gear to audio processing equipment, so they know about sound. Which does translate into the PTED01 – it sounds really good, whether through decent headphones or routed to a computer or through e.g. a keyboard amplifier. The unit itself is nicely made and includes 7 drum pads plus 2 foot pedals. The pedals are pretty much essential of course as they trigger your kick drum and hi hat cymbal (just like a real drummer – it’s 2 hands plus 2 feet!). And they are quite a lot better than the pedals that come with the Yamaha unit. TIP: use a non-slip rug or rubber gripper mat to put your pedals on though. This works so much better. Or just tape them down! The main unit is really nicely portable as it only weighs in at 7.3 pounds, almost 2 pounds less than the Yamaha for example. The pads are good and responsive, you’ll probably find you get the odd missed hit once in a while with really fast drumming. But that’s to be expected with this type of gear. Connectivity is good too – it has USB for connecting direct to a PC or Mac (it does MIDI in/out), and a headphone socket of course to practice quietly. The drum sounds are really nice. It comes with 25 preset drum kits and 215 percussion voices and 128 GM (General MIDI) voices. You can create and store 5 custom kits of your own too, plus store up to 100 songs on the unit itself (unlimited of course if you connect to a computer). There is also a metronome system built in for helping with your timing/rythm. Also included in the Pyle-Pro PTED01 package is a pair of drum sticks, a DC adapter so you don’t need to use batteries. Plus the two foot pedals of course. If you’re wondering who Alesis are, don’t be concerned! They have been in this industry since the 80’s and make all sorts of pro quality drum machines and keyboards. So you can trust the brand know what they are doing. The Alesis looks quite similar to the Pyle-Pr. It has the same 7 pad layout, same body shape, the same foot pedals and weighs in at the same 7.3 pounds. All of which is good news. The CompactKit 7 however offers 45 preset kits, 5 user kits and 265 drum/percussion sounds. The most out of the 3. It also offers USB-MIDI too, headphones output and has a built-in metronome. The drum sounds are again really good quality – close your eyes, use good headphone and you’ll be struggling not to think these are ‘real’ drums. There is also a neat button to switch to ‘Hand Percussion’ mode. This instantly adjusts the sensitivity to suit using the pads with your hands instead of sticks. Want to play bongos? Now you can! 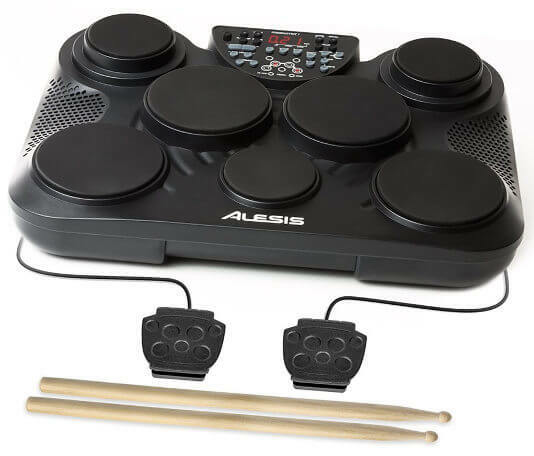 The Alesis CompactKit 7 also includes drum sticks and an external power supply. There are no headphone included, but you’ve probably got some half-decent ones already anyway! And pricewise it comes in typically around $40 or so less than the Yamaha. Don’t get me wrong, the Yamaha is a really nice piece of kit. Especially at this price point. It’s just that I think Yamaha have been caught resting on their laurels – the DD65 has been incredibly popular for a long time, so they haven’t done anything to improve it. Meanwhile, Pile-Pro came along and made the PTED01 which on the whole is just as good. But then Pyle add better foot pedals and now it costs less money! But honestly. If you get either of these two, you’re not going to be upset. Both are great machines and do way more than most people will ever need. Whether you’re learning to drum, need a new toy or just want something to take on the road. So the Yamaha has 8 pads and two pedals. The pedals are really just buttons rather than any attempt at a digital ‘pedal’ – as you can see in the photo above. They work, but just could be better. Note: you CAN upgrade these, but I’d suggest living with them for a while to see what you think. The unit itself weighs in at a sturdy 9 pounds, so it is a couple of pounds heavier than the Pyle. If you want portability it’s worth being aware of, but that’s still pretty lightweight for lugging. There are over 100 drum sounds organised into 50 different kits/custom kits. If anything this is where the Yamaha may have the edge. It’s close, but the drum sounds are really high quality – through quality headphones or an external amplifier you won’t know them from a real high quality drum kit. TIP: I’ve seen some people criticise this unit for unresponsive drum pads. They didn’t read the manual though! Because you CAN adjust the sensitivity. If you find the pads are not triggering sometimes, then increase the sensitivity setting, and be happy again :-). The DD65 unit has USB for MIDI in/out, and a headphone socket of course. 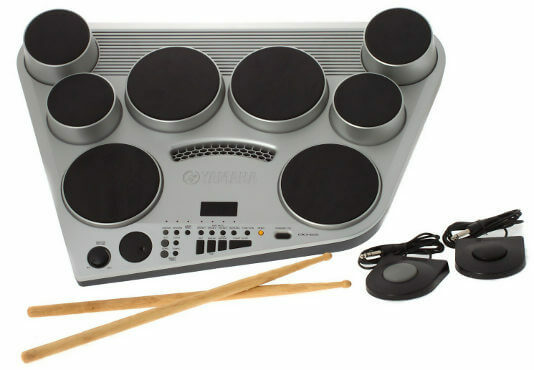 It also comes with an external power supply (you can also use batteries), headphones, foot pedals and a pair of drum sticks. All 3 of these digital tabletop drum kits are a lot of fun. They offer an absolute ton of great features at what has now become an incredibly low price. So if you go for one of these you’re not going to be disappointed. There are subtle differences between them, but these 3 are all essentially great buys. So if you’re not sure which to get, just get whichever one you can find for the cheapest at the time! That said, if the prices are similar, I’d favor the Pyle-Pro PTED01 or the Alesis CompactKit 7 over the Yamaha DD65 – purely because those pedals are better. And for me, the Pyle just wins outright. With the PylePro and Alesis models having exactly the same chassis, pads, buttons and pedals, how are the two any different from one another? I bought the Alesis, and I have an issue with the pedals ‘bouncing’ (i.e. registering an extra hit instead of the expected one on occasion when pressed). They are very similar – the Alesis has more sounds & kits. But either of them are a great buy. There are a couple of things you can try with the pedals. Firstly, with practice you can learn to minimize/avoid the double hits. But you can also try a bit of a hack. Try padding out the gap between the underneath of the pedal pads and the actual switches. Just glue in some small spacers made out of something dense but with a little give in it, e.g. dense foam or rubber is ideal. This can work really well. Hope that helps. I had the same problem and kinda solved it by inserting some spongy material inbetween the upper part and the sensor part, to increase the gap to avoid double hitting. It is a shame for Alesis though. Thanks for this article – super helpful. 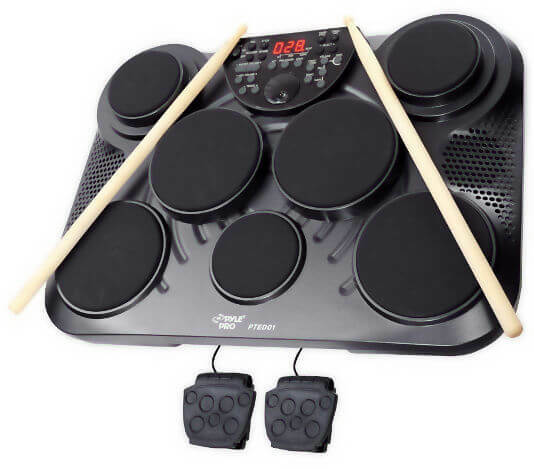 I’m looking to buy a tabletop drumkit for my 11 year old son, who is tall and growing fast. He loves to drum and will have lessons on a proper kit but we are very space-poor. How would you compare the Alesis Compact 4 with the Alesis Compact Kit 7? I understand one has more pads – will I be making a big mistake getting the ‘4’ if he really wants to do some ‘serious’ drumming? Many thanks! The CompactKit 4 is really good and a lot of fun too (it has 4 pads vs the 7 pads for the CompactKit 7). But as he’s going to be learning on a real kit too, I would tend towards the larger 7 pad version – it’s just going to be more versatile and last him longer. Unless space really is that tight, in which case he’ll still have a lot of fun with the 4. Hope that helps.